In Checked, one family’s deep involvement in hockey provides the background for life questions. 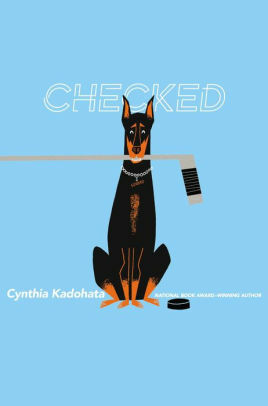 Checked by Cynthis Kadohata. Atheneum, 2019, 404 pages. Connor McRae, age 13, has already lost two moms: his birth mother to an early death and his stepmother to divorce. He didn’t really bond with the latter, and he understands that one reason for the breakup was him—that is, his obsession with hockey. Hockey is a family sport by it’s very nature, because you can’t play it in the local sandlot or bowling alley. In southern California, where ice doesn’t naturally occur, the sport requires frequent travel and expense. Connor’s dad, a former player who briefly made the NHL, is totally on board. And Connor’s doberman Sinbad is in his corner no matter what. But Connor himself is beginning to wonder if hockey is worth the cost, in spite of his passion and gift for it. His dad is depressed; a broken marriage, money worries, and the pressures on a cop are taking their toll. And Sinbad hasn’t been acting like himself. Life is increasingly getting in the way of the best-laid plans. The author, a Newbery medalist and hockey mom, knows the details of this under-reported sport extremely well. Through Connor’s eyes we get a glimpse of what it takes. The story glides more than it drives, missing a strong central plot thread. But due to Connor’s winning personality and pitch-perfect voice, his story is compulsively readable, especially to sports fans. There are no bad guys and some very good guys, including Connor’s best friend Jae-won and his teammate Lucas, an unashamed Christian who continually reassures him of his prayers. Connor comes to no firm religious conclusions himself, that’s worthy of discussion (see questions below). But he ends up on a more secure footing than when he started, and that’s the direction life should take. How does Lucas witness to Connor regarding his Christian faith? How would you do it? On page 403, Connor observes, “. . . if there is a God, that’s not what he is. He doesn’t just give you anything you beg him for . . . You just gotta be a good person. But your dog’s gonna die when he’s gonna die. I’ll keep praying, though. ‘Cause it’s important to believe.” What do you see as biblical and not-so-biblical about his conclusions so far? Oh, I’ll have to check this one out. Hockey is the only sport my husband follows, so if he succeeds in passing that on to our boys, I could see this appealing to them once they’re ready for middle grade. It’s also refreshing to hear that a Christian character is being portrayed in a positive light.